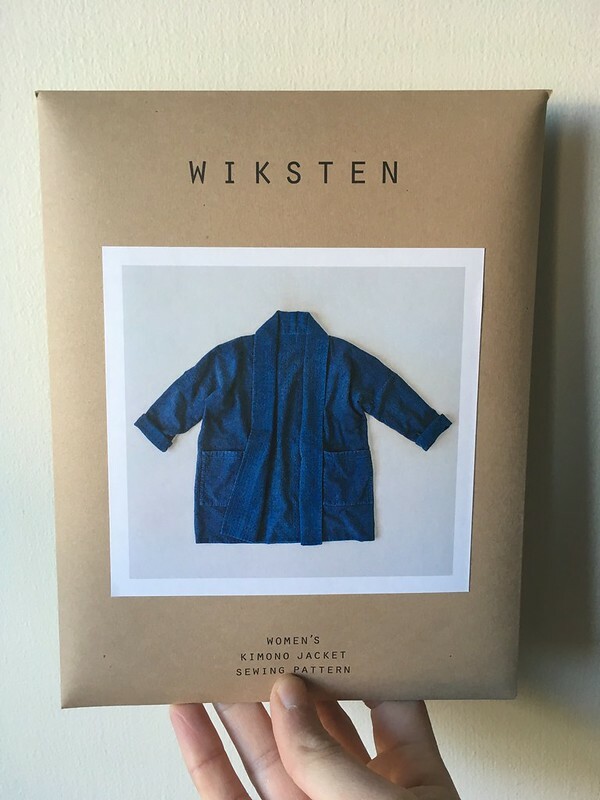 The Women’s Kimono Jacket from Wiksten, commonly called the Wiksten Kimono has been pretty popular in the sewing community. 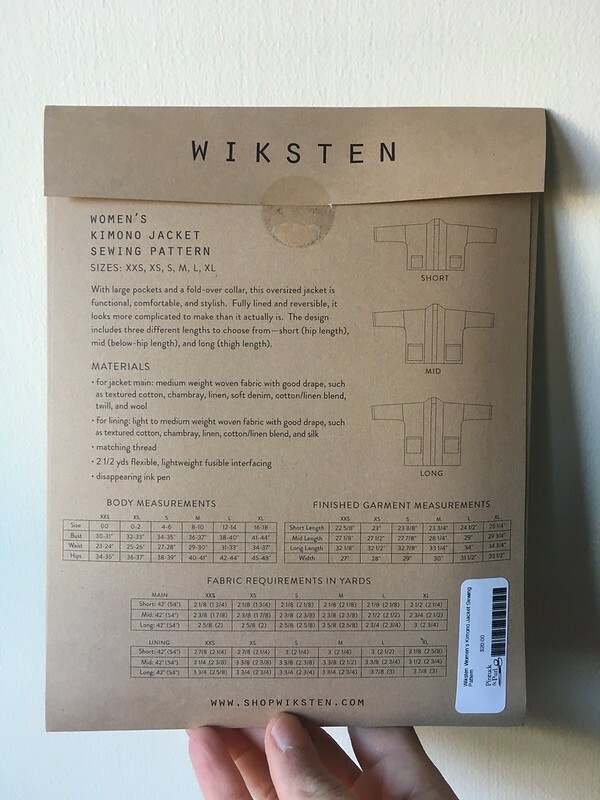 The first version of this pattern, by Jenny Gordy of the sewing pattern company Wiksten, came out in Making Magazine No. 4/Lines. 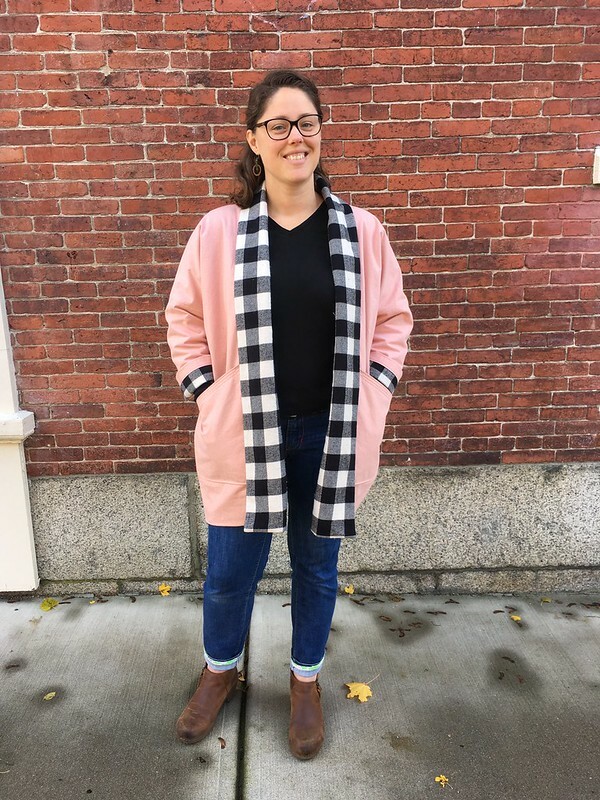 Since then, Jenny has updated the pattern, adding different lengths and refining the fit, and you can now buy it as a standalone pattern if you don’t have access to that issue of Making. I wasn’t too sure about the pattern at first, so I followed the #wikstenkimono hashtag on Instagram and got a look at what people were making. 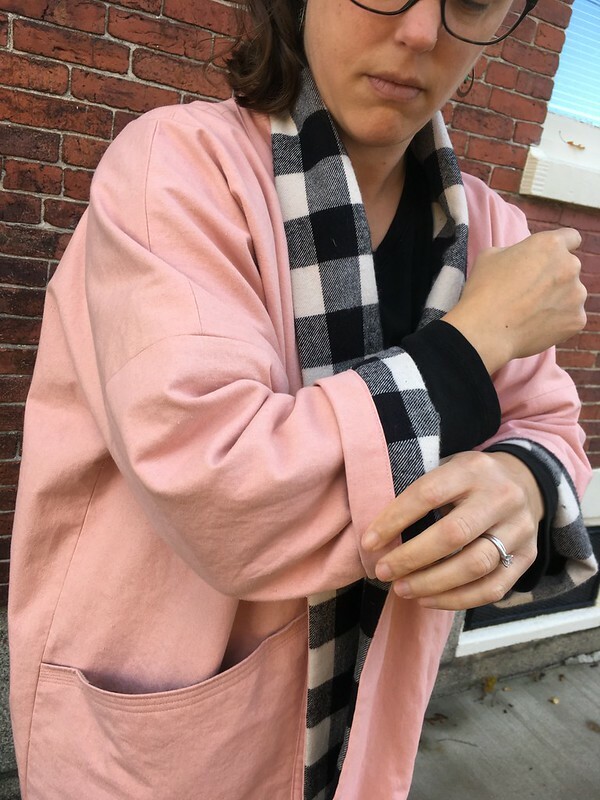 The more I thought about it, the more I realized that this was my kind of jacket, and people reported that they loved the process of sewing it. When Pintuck & Purl stocked the pattern, I made sure to snap one up. When contemplating which version to make and what fabric to use, I initially planned to make the mid-length version. As the weather cooled off, though, I thought maybe I would want the long one to wear over leggings and cozy up in during the cold months. 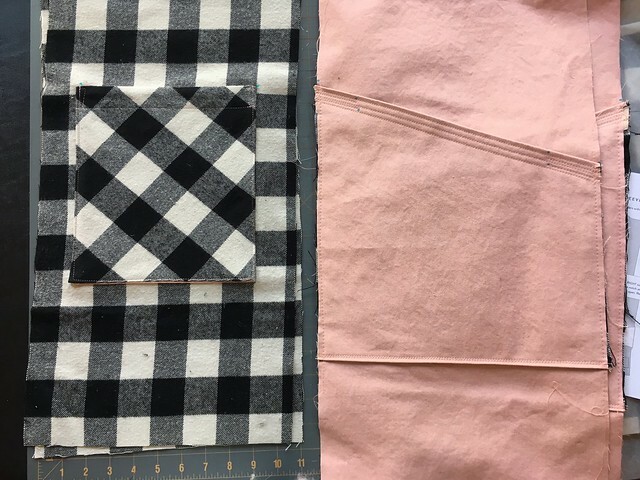 Most of the versions on Instagram during the time I was trying to make fabric choices were in linen, and I considered using some yellow linen for it, but then I had a thought. 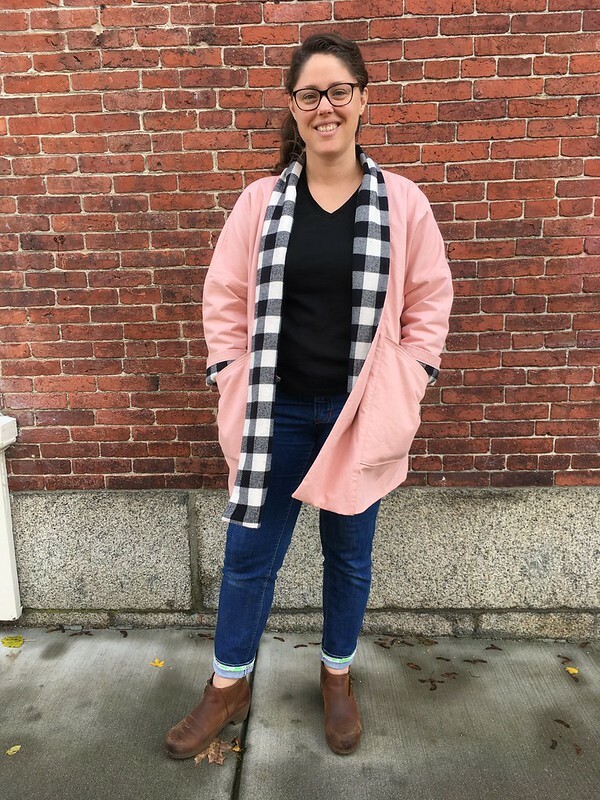 Why not figure out what it was that made me reach for favorite garments in the fall? Which things did I want to pull on over my t-shirt when I was hanging out at home or meeting with friends to catch up? Once I asked myself that, I could see I needed to make this jacket cozy. My first thought was cotton flannel lined with fleece, to get a feel like a fleece-lined flannel shirt. 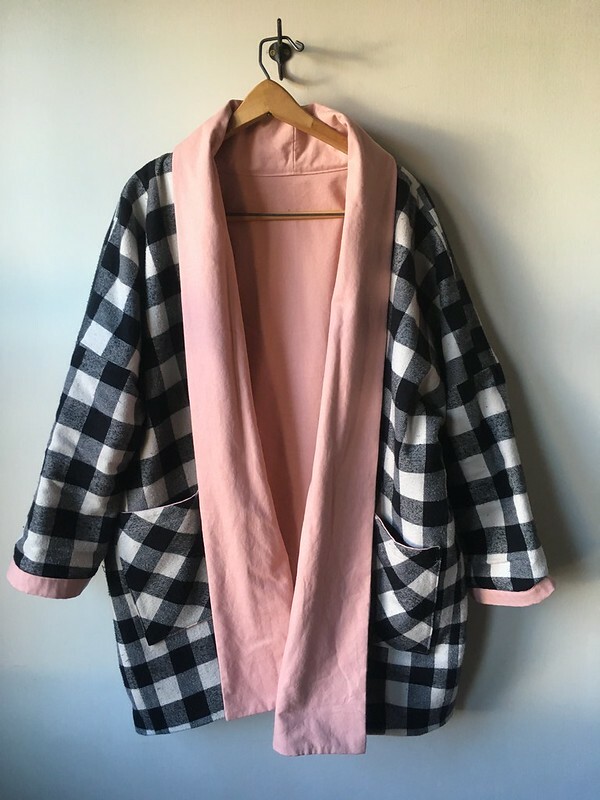 It might end up looking like a bathrobe, but it seemed like it was a risk worth taking for my first version. Even if it was only something to wear at home, it would still be a win. 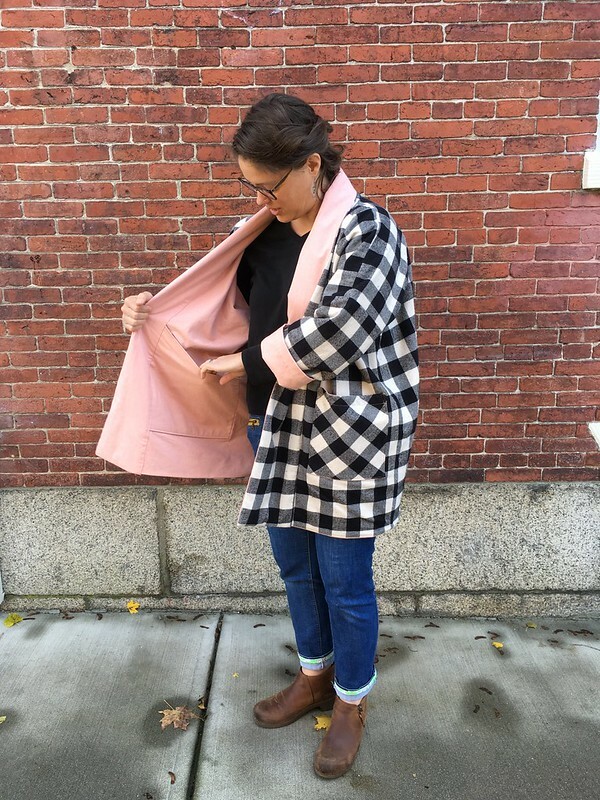 I talked it over with some of the ladies at Pintuck & Purl, and realized that we had some very cozy flannel that no one had tried yet, AND I had already purchased some pink (“Heather”) Cloud9 Tinted Denim that would be GREAT with that flannel. I was planning to make pants with the Tinted Denim, but this idea struck me as an even better idea. 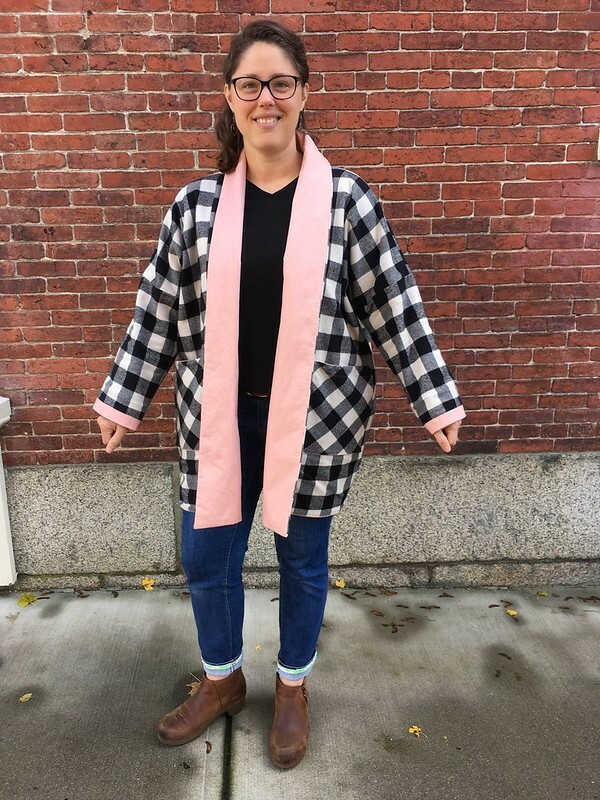 I was told very firmly that I needed to at least try to pattern match my plaid and that I was going to have to straighten out the grain on the flannel just a bit because it was a plaid that I needed to try to pattern match. 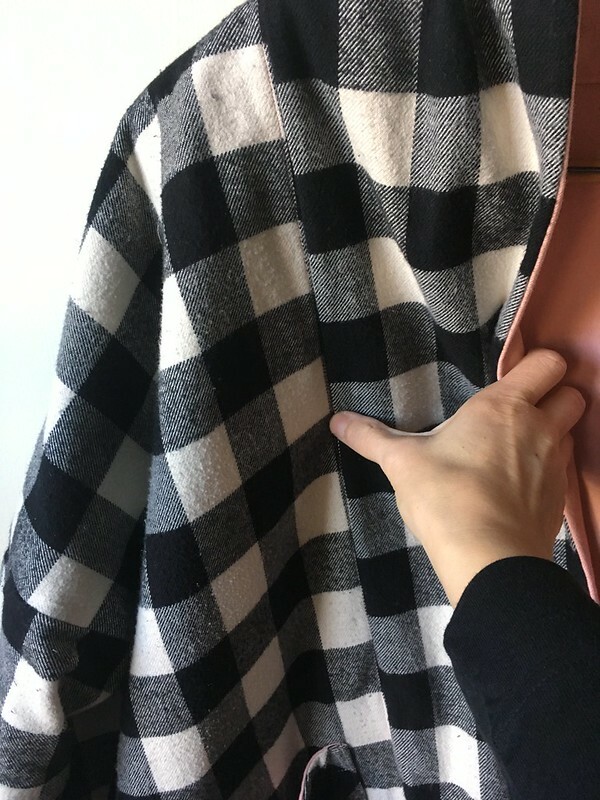 It’s not uncommon for fabric to become off-grain as it goes on the bolt, and while it’s usually not an issue, this was something I should try to put right. I only offered weak resistance, because I knew they were right. 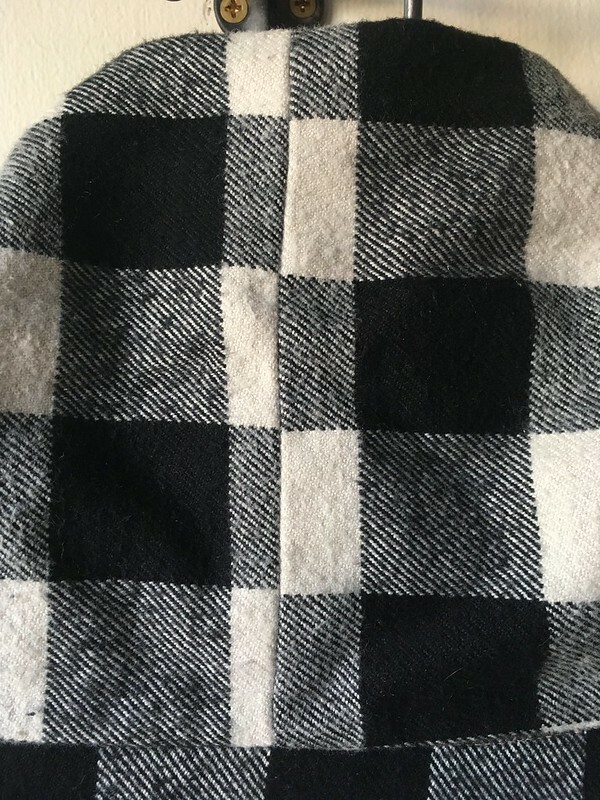 I took my flannel home and prewashed and dried it, and then my husband and I attempted to pull the fabric on the bias from opposite sides to try to get it back on grain. I think it worked. Believe it or not, that was the first time I had ever tried that. Both the flannel and denim are nice and soft. The denim is fairly lightweight. I’ve used it before for these shorts and this shirt (in yellow), and I really love it. It’s such a nice fabric that ages beautifully, softening up over time. 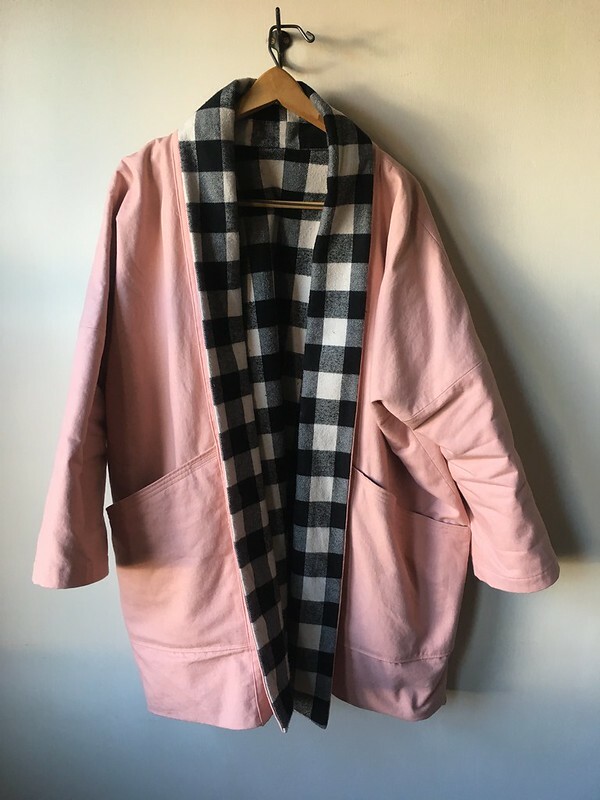 The flannel is from a company that is new to me, Marcus Fabrics. This buffalo check comes from their Primo Plaid Flannels: Classic Tartans line. So far, I really like it–it’s extra soft. Other than that, I used whatever thread I had lying around (which meant I used three subtly different shades of pink, switching to the next shade when the previous one ran out). I also tried sew-in interfacing this time (pictured below). Normally I just use basic fusible Pellon interfacing from Jo-Ann Fabrics, but I got a bunch of Si-Bonne interfacing from an estate sale I went to. I hadn’t heard of this brand before, and I don’t think it’s around any more. I put the interfacing in the washer and dryer to preshrink it, and then basted it to the collar pieces by hand (next time I’ll do it by machine). A lot of people skip the interfacing in the collar, but I wanted to stick close to the pattern as written for my first attempt, with the exception of different pockets on the outside layer. The sewing itself wasn’t difficult. I traced a large and cut the longest version. I changed my outer pockets to larger ones that extended across each side of the front pieces with an angled top, and I had fun adding extra topstitching to the top and bottom. 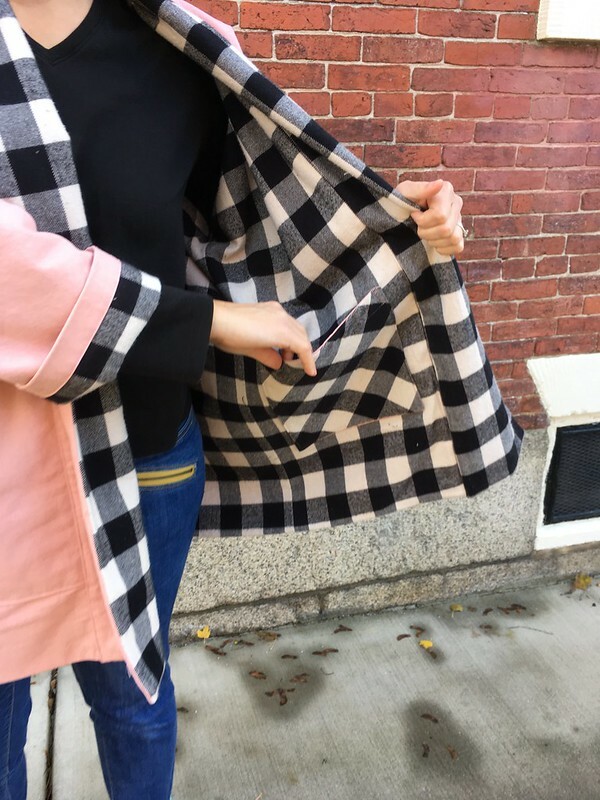 My topstitching inspiration came from Helen’s version as well as a fashion image I have of a jacket collar with multiple parallel lines of topstitching. I lined it with flannel so it would be soft and warm. 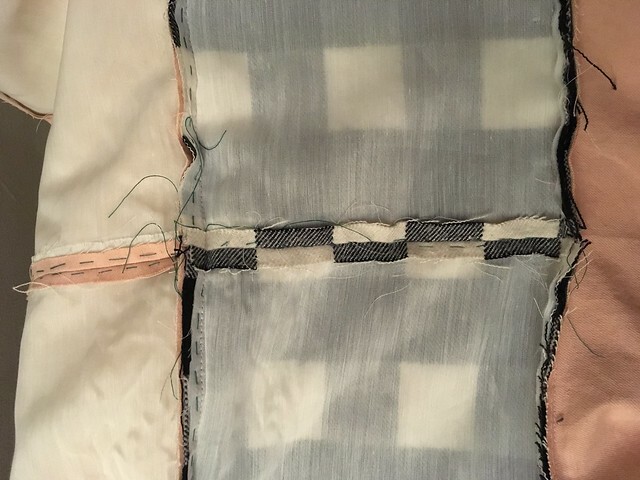 I also added the original patch pockets to the inside so the jacket would be reversible and so that no matter which way I wore it, I would have inside and outside pockets. I am so happy about that decision every time I wear this jacket (and I have worn it most days since I finished it). I cut the patch pockets on the bias for visual interest and made sure to line them with denim so that they wouldn’t stretch out of shape. In a perfect world, I probably would have cut the flannel side of the collar on the bias as well, since it would have looked really cool, but I didn’t buy enough for that. I was nervous about the plaid matching, so I decided to try to match the horizontal lines of the plaid at the side seams, which turned out great. 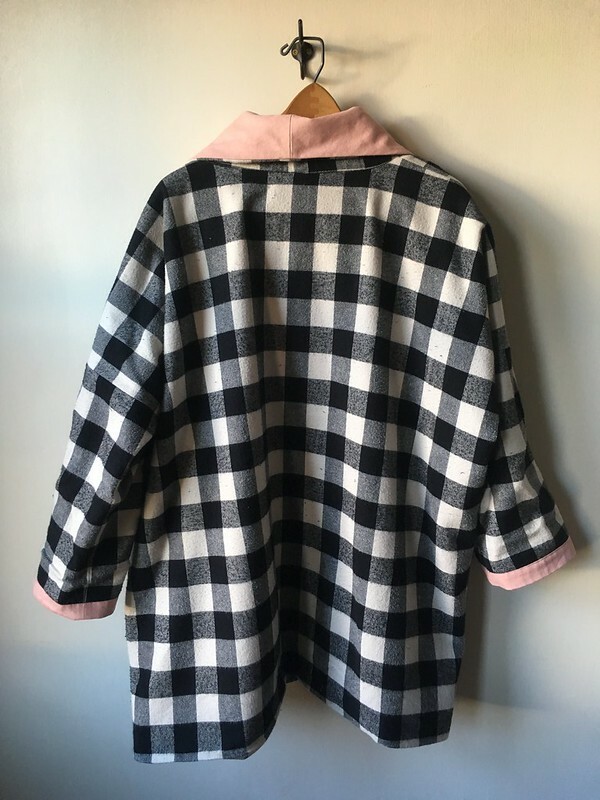 The flannel on the collar was too much for my brain, so that doesn’t really match where it attaches to the body, but because of how the collar folds out to contrast whichever side is on the outside at the time, you don’t really see them together. I love how I managed to match things up at the center back collar seam, though! When I put this on after I finished sewing it, I looked in the mirror, saw how huge it was…and loved it. Sometimes I make something oversized and don’t like it, but this is huge, and I LOVE it. 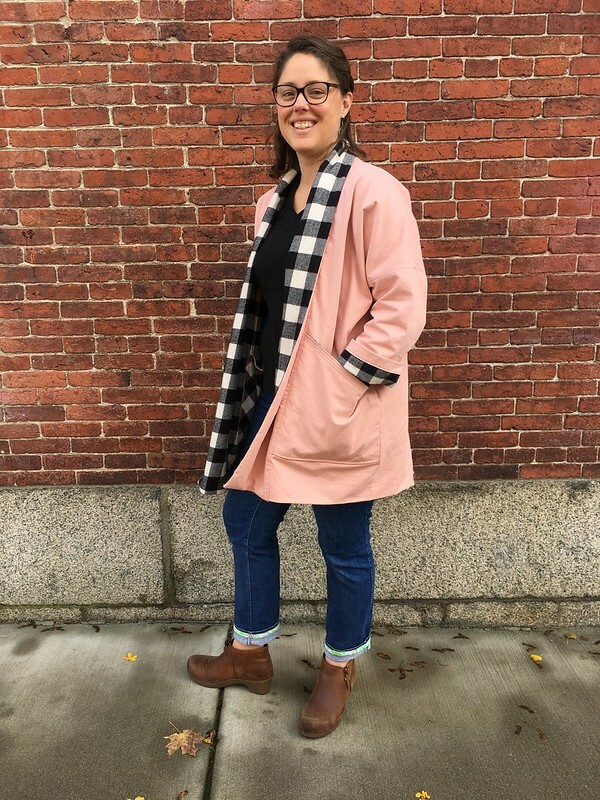 It feels so good to wear, and is so cozy and, in its own genre, is pretty cool. 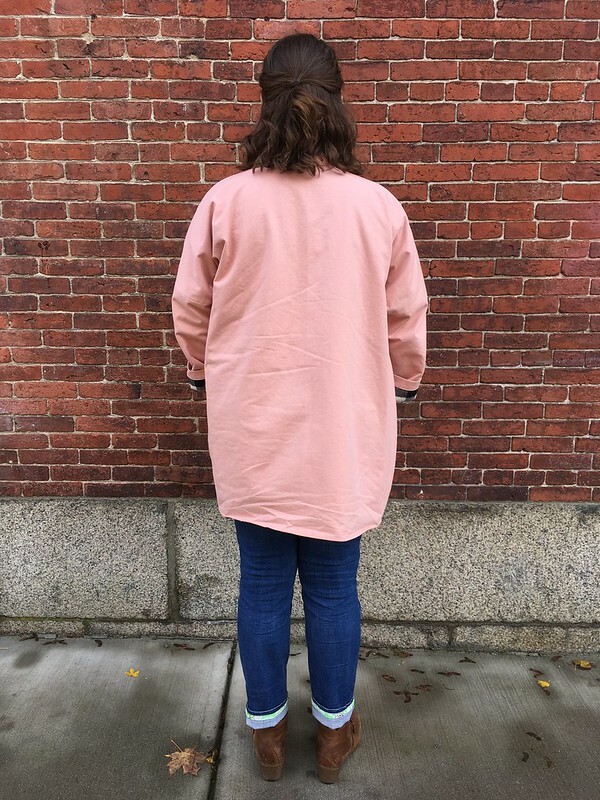 I’ve worn it with jeans and leggings, both with the sleeves cuffed and un-cuffed, and can definitely see myself making other versions. I’d love to make the mid-length, and maybe even the short length in a fancier fabric. The sew-in interfacing makes the collar soft and substantial, perfect for turning up to cover my neck when it’s cold. I could definitely see making other versions in wool or maybe my original flannel + fleece idea. If you are new to sewing, and this is a style you like, this would be a great pattern to try. It’s not too difficult and it’s a pleasure to sew, not to mention you get two garments in one since you can wear it as a reversible garment if you want to. If you’re not new to sewing and you like this style, I think you’ll like it too. 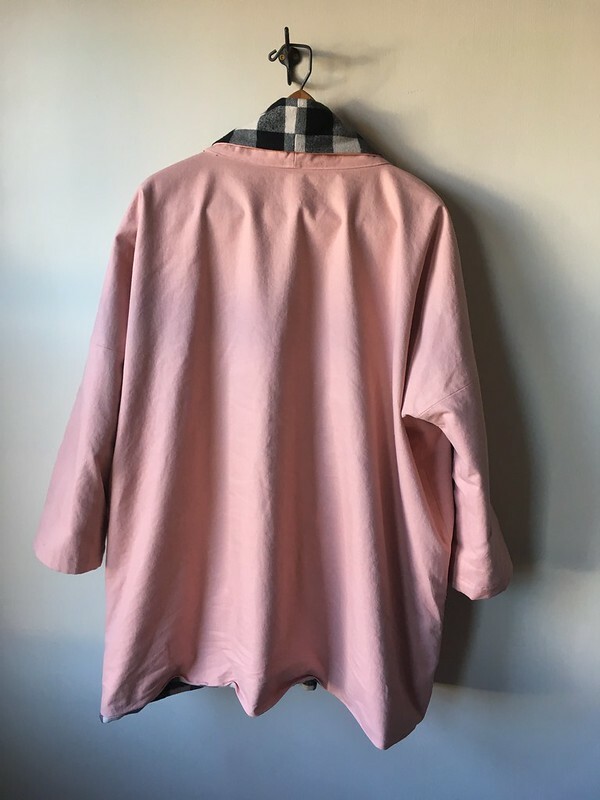 Update: After wearing this for three days and then washing it, I went back and edgestitched/topstitched along the bottom and the outer edge of the collar. My flannel fabric wanted to roll to the outside, even after having understitched during assembly (I think it’s a looser weave than the denim). I’m hoping this will help prevent that. Even so, I love the jacket and have worn it most days since making it.